Apple CEO Tim Cook has announced Apple is donating $1 million to help relief efforts taking place in Indonesia after the recent earthquake and tsunami, in a continuation of the iPhone producer's charitable efforts following major disasters over the years. Posting to Twitter, Apple CEO Tim Cook confirmed the donation by the company is taking place, adding "Our hearts go out to the people of Sulawesi and all of Indonesia after this weekend's devastating earthquake and tsunami." The 7.5-magnitude earthquake hit near the central island of Sulawesi, triggering a tsunami that landed at the city of Palu, reports the BBC. 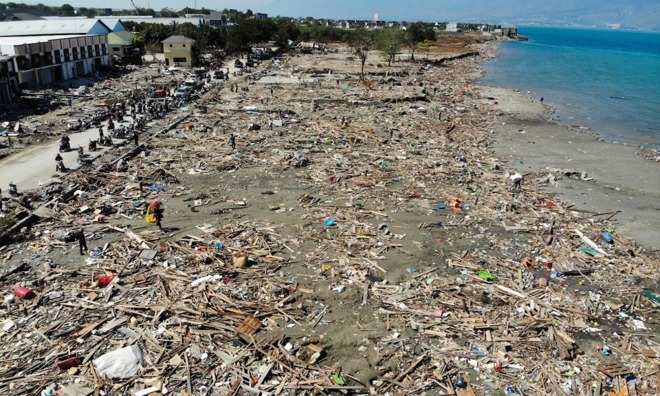 Disaster response officials have so far declared the death toll of the natural disaster at over 1,300 people, and the number is likely to rise as the full impact of the events are examined in the coming days and weeks. Our hearts go out to the people of Sulawesi and all of Indonesia after this weekend's devastating earthquake and tsunami. Apple is donating $1 million to aid relief efforts as this beautiful country starts to rebuild. Incidents of looting are being cracked down on by law enforcement officials, following a brief period where survivors acquired basic goods, with humanitarian relief convoys and food supplies arriving two days after the event. The United Nations Office for the Co-ordination of Humanitarian Affairs estimates there are close to 200,000 people in need of assistance, with a quarter of those said to be children. The donation to the Sulawesi relief effort is one of a number of similar offers of aid provided by Apple in the event of major catastrophes. Before Sulawesi, Apple pledged a $1 million donation to the American Red Cross, to help those affected by Hurricane Florence. In August, Apple opened its iTunes donation mechanism to help victims of the Kerala floods in India, as well as pledging 70,000,000 rupees (approximately $1 million) to support Mercy Corps efforts in the region. Earlier in the same month, iTunes donations were accepted to the American Red Cross for the California wild fires. Apple also launched initiatives to support the U.S. national park system on August 23, including pledging to donate some of the proceeds of Apple Pay transactions to the National Park Foundation for a week. In 2017, Apple contributed $5 million to the "Hand in Hand" hurricane relief effort following Hurricane Harvey, matched worker donations two-to-one to provide California wildfire relief with $1 million in October, and provided another $1 million to assist in rebuilding and recovery efforts following the wildfires in December.